Some months ago here at Motoring Weekly, we wrote about the V12 motor developed by some Australians who “stretched” a General Motors LS1 V8 to be effectively 1.5 engines – and they were casting a full block rather than connecting two motors together. Now we have found a company that has gone the other way with the LS1 – they have shrunk it down to a V4. Motus, a now defunct US based motorcycle manufacturer, took the venerable V8 and cut it down to size for motorcycle use. If you wanted a US manufactured motorcycle then the choice was limited: there were three main manufacturers, Victory, Harley-Davidson and Buell. Two of those are now dead and what Motus wanted to do (which was admirable) was to make a fully US designed and built bike however the problem was that there was really only one US sourced motor – Harley-Davidson. Many limited production manufacturers of both motorcycles and cars use engines from established and reliable sources: for cars it seems to be AMG or BMW, for motorcycles it could be BMW, Ducati or Yamaha. 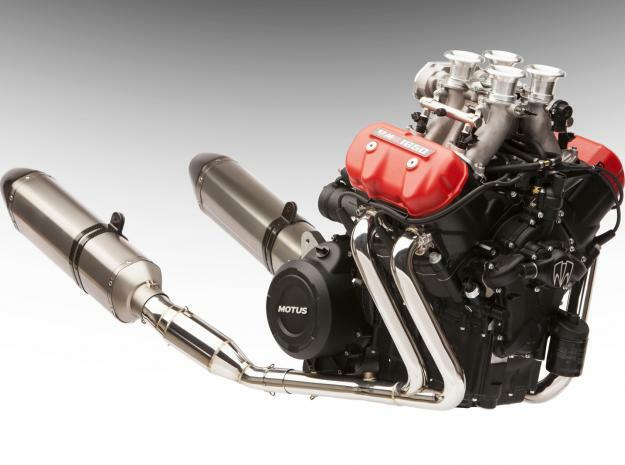 So Motus wanted a US sourced motor and the LS engine was one that has a history of reliability and there must be 100,000s of donor motors outside of getting a crate motor from GM. Importantly, the motor has a network of tuners and after-market component providers that make the motor more powerful. Strictly speaking, the motor isn’t an LS V4 by simply cutting the block in half as the name suggests – it is a motor that was modelled on the Chevrolet source design to take the components found in the original. It is slightly smaller in size – 1.65 litres (as opposed to 2.5 litre if you really did cut an LS1 in half) with a different bore and stroke and it weighs about one third of the motor it is based on. Subsequently, its name is the “American V4” to distance it from the GM version. In essence a competent tuner could take the new block and fill it full of kit from different sources to make a true powerhouse. The base configuration before any tweaks could put out 160hp although that could rise because the design allows for a different bore and stroke that in theory could turn the motor into a 2-litre with a load more horsepower. Then adding in some forced induction would give more bang for the buck. Motus had a very limited run of their motorcycles – they appeared to be too expensive for their home market which suggests that their marketing was wrong. Most competing sports bikes were cheaper, especially mass produced ones from Japan, however the Europeans build low volume sports bikes for a premium price and people buy them. Perhaps the issue was that as it was an American machine there was an expectation of a much lower price, even though the buyer was getting a state-of-the-art and high tech machine for their money. Motus had a limited time with the motorcycles before cutting their losses, however they recognised that they actually had one valuable asset – the V4 which could be repurposed for other machines. Motorcycle engines have been used in lightweight sports cars for decades. Westfield in the UK used Suzuki and Kawasaki motors in some of their vehicles and even in the 1950s, BMW put motorcycle engines in some of their bubble cars. Having a powerful yet lightweight motor in a car is ideal because it allows for great performance or great fuel economy depending on the use case. The world needs this type of motor as a choice for new vehicles and could help keep the internal combustion engine going in a market that is more and more focused on electric power. For enthusiasts and club racers, this motor could be a winner.